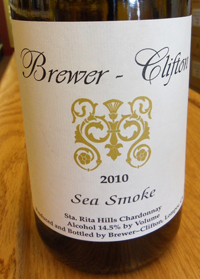 2010 Brewer-Clifton, Chardonnay “Sea Smoke” Sta. Rita Hills. In what looks like the last of the Brewer-Clifton Sea Smoke Chards, the 2010 Brewer-Clifton Sea Smoke Chardonnay by Greg Brewer and Steve Clifton is a great swan song effort, and is a wine to grab while you can, as it is wonderful, plus it is the last wine that they’ll do from this site. 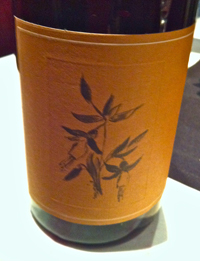 I have always loved the Brewer-Clifton wines, and one of the best wines I’ve had was their 2000 Chardonnay from Mount Carmel, and while that wine will always be my favorite, this new 2010 Sea Smoke Chard might even be better and shows such purity and focus it is hard not to fall for it. The nose is lively with citrus blossom, fig, clove and mineral leading to a rich palate of lemon, apple, pear and tropical furies with crushed stones, lime, baking spices and hint of hazelnut. This Chardonnay is pure class and reminds of Meursault in body and balance, not a wine to be missed! 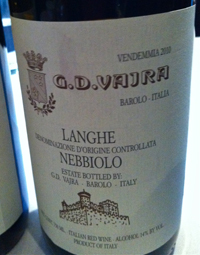 2010 G.D. Vajra, Langhe Nebbiolo, Piedmonte, Italy. I know it has become cliche to say “Baby Barolo” and almost passe, but if there ever was such a thing this wine would be the poster child for the niche! G.D. Vajra’s beautiful Langhe Nebbiolo is so pure and true it is hard to describe in a way that does not lead you back to the Barolo comparisons, as it truly is as good and as much in reality, as it comes from Barolo vineyards and has the same sense of terroir and complexity. While many Langhe Nebbioli are lighter versions, or younger vines, or lots that were not good enough for the Barolo bottling, nothing could be father from the truth here in Vajra’s expression, this wine is deep, intriguing and full of intensity. The nose is full of rose petals, dried flowers, tar, tea spice and fennel leading to a dense palate of red cherries, raspberry and plum sauce while mineral, pepper and salted licorice add complexity. There is good acidity and refined, though firm tannins hold things together and savory balsamic notes giving a mouthwatering verve, and with air a gamey truffle note shines through along with plenty of lingering fruit. This is fantastic Nebbiolo that can be drunk now, or can go another 5-7 years, and it is a super value, and I hope I get a few bottles for myself, this is the real deal. 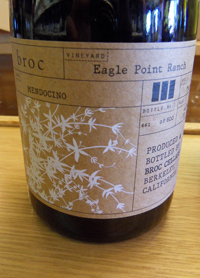 2011 Broc, Counoise “Eagle Point Ranch Vineyard” Mendocino. It is a rare wine, a single varietal bottling of Counoise, and I’ve only had a handful even from France, and it is even more rare in California, and this 2011 Broc Counoise is a great example. I had Turley’s rare Counoise last year, but as fun as it was it was nowhere near as compelling as this Broc bottling and I hope to have another bottle myself, and suggest you look high and low to find it yourself. This interesting wine is one of many really unique wines that are coming out from talented winemakers across California, like Sheldon Wines Graciano and single vineyard Grenace, Arnot-Roberts Trousseau and many others to be mentioned later. The Broc Counoise is full of spices, mineral and briar with textured fruit layers that include red cherries, poached plum, strawberry and blueberry while all spice, red pepper and dusty rocks add complexity with good acidity, supple tannins and a crisp bright finish of bramble berry. This wine is savory and lower alcohol in style, but still very pleasing and should fill out and develop nicely over the next year or so. 2010 Joh. Jos. 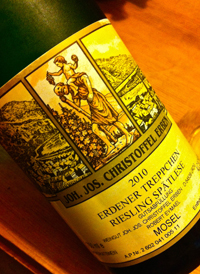 Christoffel Erben, Riesling Spatlese “Erdener Treppchen” Mosel, Germany. Christoffel’s Rieslings are some of my favorite wines and have been for many years, but I had a hard time when tasting the 2010’s as they seemed a bit tough and severe when I first tasted them, though I have been very happy as they have had some time in bottle and they are really showing well now, especially this 2010 Erdener Treppchen Spatlese Riesling from one of the finest sites in the Mosel. I adore the purity and exotic nature of the Mosel wines and Christoffel always delivers crystalline minerallity and deep flavors and this vintage is driving with force and detailed focus with apricot, peach pit, tangerine, green apple and tropical fruits and hints of honey, salted citrus, crunchy gravel and umami. There is a good level of sweetness to cover a high level of acidity, in fact I did read this wine had to have adjusted acid, but that is all good now as it feels much more refined after a year in bottle. The finish is lengthy and has mouth filling feel and lingering sweetness, though the freshness is still vibrant and vigorous. The 2010’s look to be long lived Rieslings and should really develop nicely over the next decade, and while this beauty is drinking great now, I’d say give it a few more years in the cellar if you can keep your hands off it, clearly I was not as patient, but it was still very rewarding. Thanks to Terry Theisse for bringing this producer to the States, I always get a few of these wines every year, and I can wait to grab some 2011 soon. 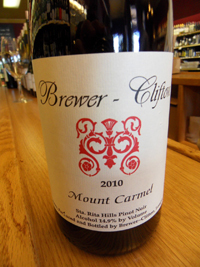 2010 Brewer-Clifton, Pinot Noir “Mount Carmel” Monopole, Sta. Rita Hills. Don’t even think about it, it is a no brainer, this vintage is another stunner from the talented duo of Greg Brewer and Steve Clifton and without question this is a must have Pinot for their fans. Recently, I had a chance to taste through all the Brewer-Clifton wines and even Greg’s other projects including his own Diatom and the Melville wines, and I have the impression that we are going to see amazing things from these wines over the next decade, as Brewer has reached a new level, and the Brewer-Clifton line is one of California’s top echelon producers of fine Chardonnay and Pinot Noir. After following these guys since the 2000 vintage, I can see the terroir and style shinning through even more clearly, and these wines are as pure as you can get. Brewer has decided to make wines without any new oak and he has really got his grips on each vineyard they use and they now have three sites that they exclusively farm to their own specifications and this has reduced alcohol levels and put the focus on clarity and place with remarkable results. The fruits of these efforts are especially evident in this beautiful 2010 Mount Carmel Pinot Noir where there is only 13.5 or so percent alcohol and the mineral, spice and terroir clearly shine through, with detailed layers of cherry, plum, strawberry and pomegranate fruits, peppery tea spices, crushed stones, dried roses, lavender and mint leaf all folding together nicely. This Pinot is rich and medium bodied, playing true to the vintage and will get better of the next few years in bottle. The slight steamy and whole cluster flavors add to the interest and should show benefits with age. 2011 Andre et Michel Quenard, Chignin-Bergeron, Savoie White, France. Another fantastic wine from Quenard, again this Domaine impresses with the new releases showing beauty, life and interesting layers of flavor. Since bringing Andre and Michel Quenard into the USA, Kermit Lynch Imports is selling out almost as fast as they offer them, showing how the Savoie is a sweet spot niche even here in America, especially for the Savvy whites that are flowing in. Both Kermit and San Francisco Importer Charles Neal have trouble keeping up with demand for the Savoie wines and it is really a bright spot for the white wine market and for those that want something other than Chardonnay or Sauvignon blank these are great wines to explore. 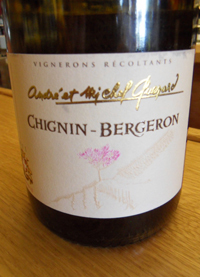 This 2011 Chignin-Bergeron is lovely and full of classy flavor and complexity with a seductive and compelling bouquet of citrus flowers, crushed rocks, mineral spice, tangerine and peach pit leading to a palate that has hints of apple, apricot, melon, tropcial citrus and butterscotch all mixing with fresh acidity, round medium body and spiciness. No oak was used here, but the wine feels smooth and rich without being flabby or weighed down, making for a flexible wine. Bergeron is the Savoie name for Roussanne and it has many of same qualities to the more well know Rhone versions, like a tighter Cousin of Hermitage or Chateauneuf Blancs and it should age and develop well, even though it is fresh and ready now. 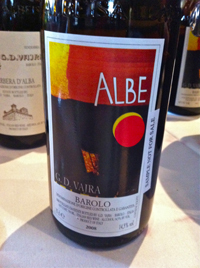 2008 G.D. Vajra, Barolo “Albe” DOCG, Piedmonte, Italy. I had the great pleasure to meet Giuseppe Vaira of G.D. Vajra and taste through his lineup of wines, all of which are stunning and remarkable from the Langhe Riesling to the single vineyard Barolo, these artisan wines are wines to search out, especially this amazing 2008 Barolo “Albe” that is a steal and can be drunk now or aged another 10 years. Last year G.D. Vajra gained worldwide attention for garnering the highest Parker (Wine Advocate) score ever for the little known Freisa grape (95) and has received a constant stream of critical praise for the wineries other wines ever since, so it was a great chance to see for myself how the whole line compared to what I have tasted before, and while last year I was blown away with Vajra’s 2006 wines, this time I think I was even more impressed! This producer should be on your radar, as these are without question some of the finest Piedmonte wines out there. The 2008 G.D. Vajra, Barolo “Albe” DOCG is beautiful and stylish Nebbiolo with pure class and elegance that few in this vintage can be, it shows dried flowers, rose oil, lavender, tea spices, tarry earth and mineral clarity with a palate of black cherry, plum and mixed berry fruit, while truffle, licorice and mountain sweet herbs, saline and umami all add to the mix. Refined firm tannins, acidity and silky finish highlight the near perfect balance and verve of this fantastic effort, this is as good as it gets for Nebbiolo, and this is their entry level Barolo! Their magical Bricco Delle Viole is even better, but costs a lots more. 2011 Arnot-Roberts Trousseau Luchsinger Vineyard, Lake County. Duncan Arnot Meyers has been getting lots of critical acclaim for his wines and has a small cult like following for his textured and uniquely detailed wines that have found a niche in “I want some different” category and I must admit I am now a believer, especially after tasting his latest efforts, like this 2011 Trousseau. Trousseau, more commonly found in the Jura region of France, might be related to Petit Verdot, but is remarkably unique in that it gives a hauntingly light color and gives wonderful spice and flower layers. Arnot-Roberts have found some magic with this grape and this 2011 is beautifully detailed, lively and elegant with dried violets, rose oil, lavender and truffle notes on the spicy bouquet while blueberry, cherry and plum fruit emerge on the silky palate with refined tannins, vibrant acidity and a savory red pepper and earth notes giving verve and complexity. This is a must have wine for wine geeks and Jura fans, plus it is really lovely, drink often and early. 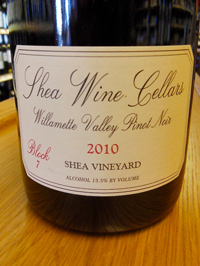 2010 Shea Wine Cellars, Pinot Noir “Block 7” Shea Vineyard, Willamette Valley. From one of the most celebrated vineyard sites in Oregon, the Shea Vineyard continues to impress for terroir and complexity and this special cuvee from a select block of vines impresses for class, elegance and subtle detail that reminds of the best Burgundy qualities with mineral, delicate perfume and sublime balance and lengthy finish. This is why we love Pinot Noir, it is a fine wine of emotion, silky texture and intriguing flavors. This is a vintage that challenged vintners and was thought to have been a light boring years, but how things have changed since that harvest, there are some amazing wines and some winemakers are now crowing about the quality found in these wines. It was remarkably similar to what happened in Burgundy, except that there is maybe less great wines from the Willamette, though the winners like Beaux Freres, Bergstom, Brittan, Owen Roe, and Ken Wright, plus others have certainly crafted fantastic wines, especial Shea and this single block wine. The 2010 Shea Block 7 is made entirely of the Swiss clone, the Wadenswil and it marvelously persistent and gives lots of energy, live and makes for a very pleasurable experience. The nose shows red spice, mineral and floral intensity with hints of smoke and red fruits leading to a palate of cherry, raspberry, dried currants, cranberry and brambly mountain strawberry fruits, flinty and chalky mineral tones, rose petal essences with flashes of pepper, vanilla, fennel and savory truffle and earth notes. 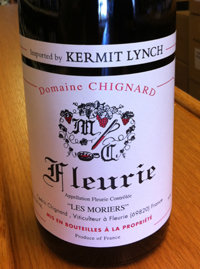 2011 Domaine Chignard, Fleurie “Les Moriers” Cru Beaujolais, France. Just plain delightful and entertainingly pretty in detail this Gamay flows with classic fruit and perfumed floral character with touches of mineral and spice. The new vintage of Chignard reveals more balance and heightened flavors with good acidity and just the right amount of earthiness adding life and interest in this fine example of Fleurie. While the 2009 marveled with density and ripeness, the 2011 is refreshingly delicate and pure, but with good complexity and a lengthy finish. The nose comes to live with incense, dried roses and violets leading to a palate of cherry, blackberry and plum fruits while a touch of walnut shells, umami and truffle add to the mix along with a bit of citrus rind and mineral. There is a hint of pepper spice that plays well with the fruit and the body is silky and almost medium weight, though it feels lighter than it is at this stage. This refined Cru Beaujolais should develop nicely and drink well for 3 to 5 years. Honestly, I enjoyed this Chignard more than any vintage in my memory, including the 2009, another winner from Kermit Lynch Imports, Gamay fans need to grab a few of these.